What is the Best Spiral Binding Machine for Small Business? 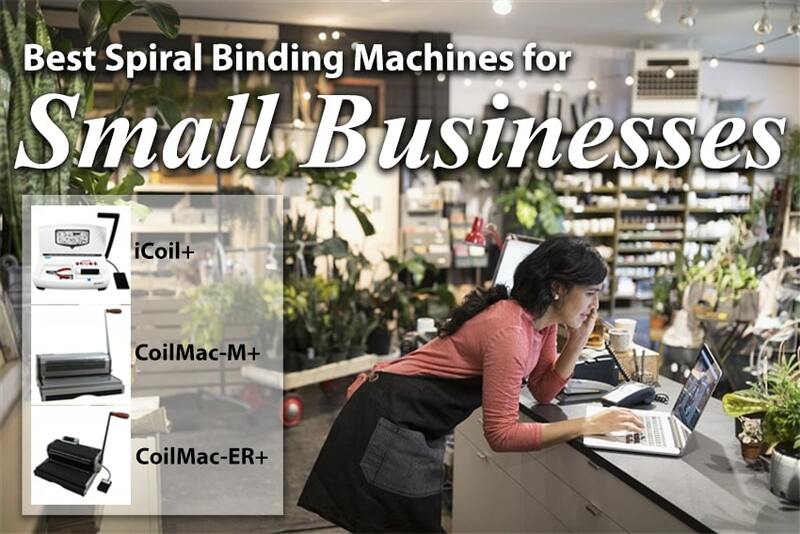 If you run a small business that needs to bind semi-regularly, and you're tired of spending high costs to outsource your jobs to print and copy shops, then it may be time to invest in an on-demand spiral binding machine that you can keep in your office to use as often as you need. While sending your document binding jobs out to these facilities is typically quite simple, it can cost upwards of $20 per book, depending on the complexity, size. With an in-house machine, however, you can make these coil books for pennies on the dollar; the machine will pay for itself and you will start seeing significant savings quickly! Having a plastic coil binder gives everyone in your smaller office the opportunity to quickly make their own presentations, reports, notebooks, or anything else they may need, whenever they need. The iCoil Plus by Akiles is the perfect spiral binding plastic coil punch and bind machine for businesses or personal users that have a low-volume or only an occasional need to bind with coil spines. Very easy-to-use, this small coil binder machine punches oval holes, which makes inserting coils into books, especially thick books, up to 50% faster and much easier. This binding punch is very compact , taking up only a small portion of a work space with a small footprint, and even folds closed for easy storage and dust-protection when not in use. The vertical punching mechanism can punch up to 15 sheets (20# bond) at a time, with a maximum punching length of 11", making it ideal for users who only punch letter size 8.5" x 11" documents. The punching die mechanism is made from a heat-treated steel that ensures worry-free use. The punching is done manually by pulling on the handle, and the inserting is done electrically using a foot pedal that can be pressed by foot or hand, depending on the operator's preference. With a maximum coil inserter rating of up to 7/8", you can punch and bind the most common coil binding sizes with this compact unit (larger coils can be punched, but they may have to be inserted by hand). The Akiles CoilMac-ER Plus Spiral Binding Binding Machine is a fully featured, heavy-duty manual coil punching machine, with a built-in mini electric coil inserter. The re-designed & improved CoilMac-ER+ is the ideal partner for low to mid-volume workloads of the small office. It features an extended 13" punching throat with open ends, allowing for larger sheets with just a second punch (up to 26"). With a higher punching capacity than other machines of its size, the CoilMac-ER can punch through up to 20 sheets of 20# bond paper at a time. A super strength punch mechanism with an exclusive "precision guiding system" features a cast-hardened and heat-treated steel die hardened blade set for a powerful and clean punch, every time. The coil inserter is foot-pedal operated, leaving both hands free to hold your book. Side margin control lets you perfectly center your holes for different paper sizes, while document margin control offers you the ability to adjust the depth of the holes, so you can find what works for your book. Rugged all-metal construction makes the CoilMac-ER extremely reliable and durable. A large waster drawer allows for more punching with less trips to the trash can, and non-skid rubber feet keep the machine firmly in place while in use. The CoilMac-ER has received CE certification, approved through the most stringent requirements, and has also been manufactured under ISO9001 & 14001 guidelines for highest quality control & environmental management standards. Included with your purchase is a coil diameter selector tool and premium oval coil cutter crimpers.